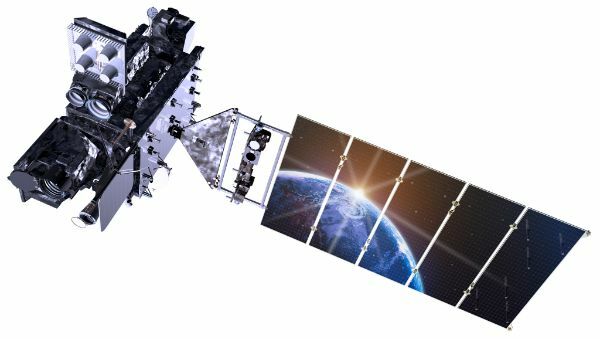 Likened to upgrading from grainy black-and-white TV to high-definition vision, the introduction of the fourth-generation of America’s high-altitude GOES satellites marks a major leap in forecasting adverse weather, detecting wildfires, and warning of space weather events to ultimately save lives on Earth. Atlas V jumped off its Atlantic-side launch pad at 22:02 UTC, 5:02 p.m. local time, enlisting the help of four Aerojet Rocketdyne Solid Rocket Boosters to catapult it skyward and send the 5,200-Kilogram GOES-S satellite on its way. 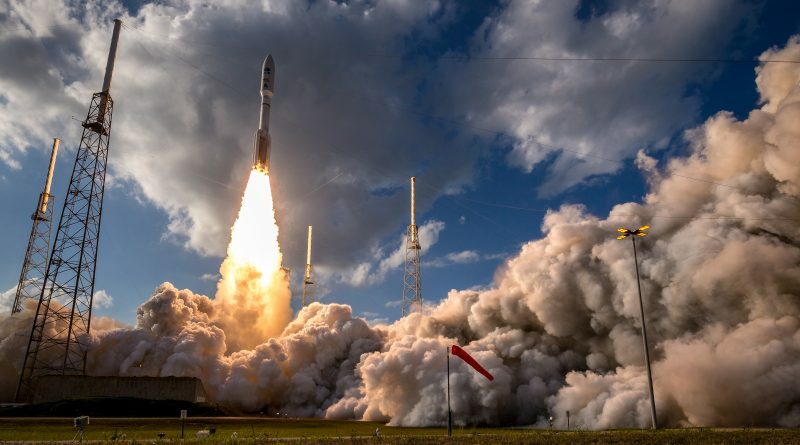 The boosters dropped away less than two minutes into the rocket’s climb and Atlas V relied on its Russian-built RD-180 main engine until four and a half minutes after launch when the trusted Centaur stage took over, conducting its 247th mission. Centaur and its hydrogen-fueled RL-10C engine were tasked with three firings on Thursday, taking GOES-S halfway around the world over the course of the methodical orbit-raising operation in a bid to drop the satellite off closer to its operational orbit and so provide it with an additional four years of propellant margin. 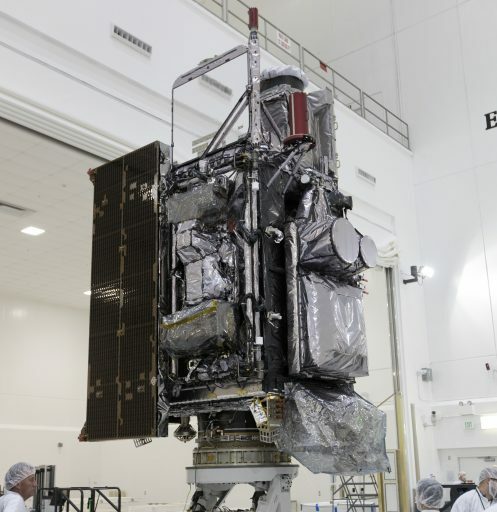 The final injection burn over the Java Sea was declared a success and loaded springs pushed the satellite on its way three hours and 32 minutes after launch, some 33,000 Kilometers above the planet – putting the checkmark behind Atlas V’s 76th mission. Separating from its booster after a smooth climb, GOES-S headed off on two weeks of orbit-raising burns to reach its desired high-altitude perch 36,000 Kilometers above the equator where its speed is interlocked with Earth’s rotation to enable the craft to remain in the same position relative to the ground. Half a year of checkouts are on tap before GOES-S will assume active duties as GOES-17 in the GOES-West position, watching over typhoons in the Pacific Ocean and weather events across the continental United States. 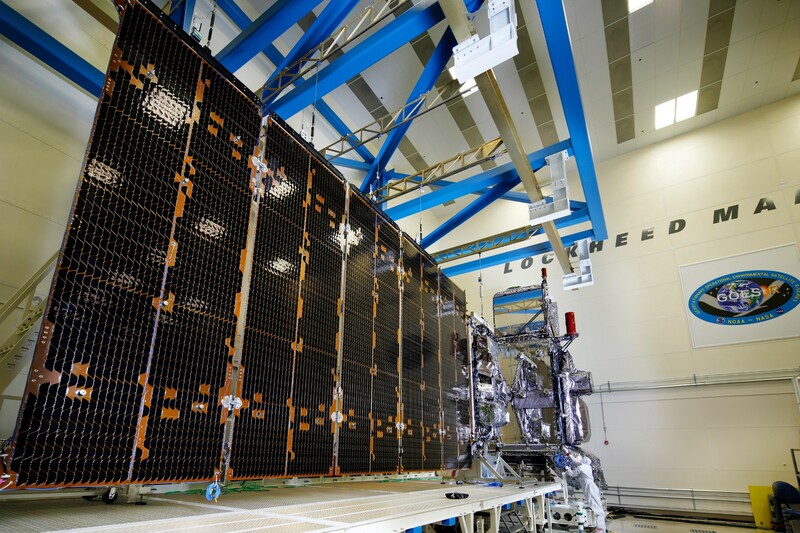 The arrival of GOES-S is eagerly awaited by meteorologists and climate scientists alike after its sister satellite, GOES-R, already proved its worth even before entering operational service in December. 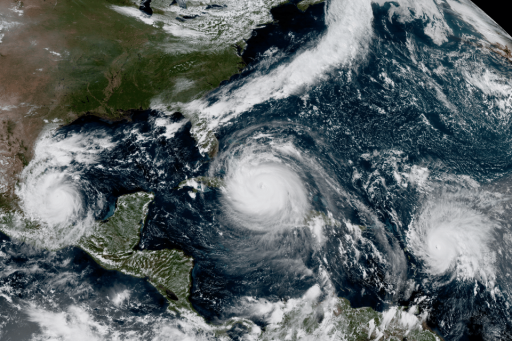 Launched in November 2016 as the first in the new generation of spacecraft, GOES-R delivered life-saving data during the 2017 Atlantic Hurricane Season – providing accurate wind and rain forecasts for Hurricane Harvey that caused major flooding in Texas in August and September and the satellite was also on the case when predicting where destructive Hurricane Irma would cross over the Florida Keys with over 24 hours of lead time. Naturally, there is a great desire to fill the GOES-West location with an equivalent asset to obtain similar data for systems forming in the Pacific Ocean. 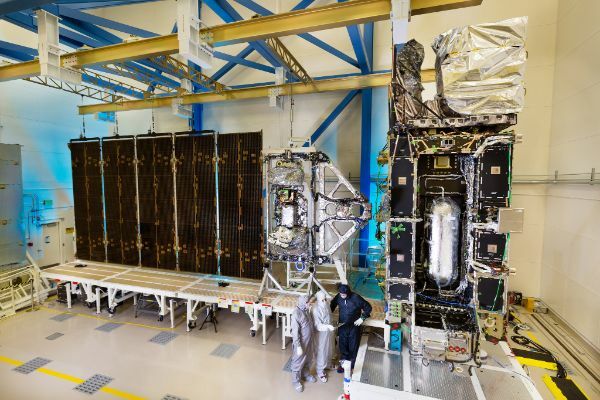 The GOES-R class of satellites and their state-of-the-art ground system is an $11-billion undertaking and involves a total of four satellites to keep the GOES system in operation through 2036. Next in line are GOES-T and U, set for launch in 2020 and 2022 to become in-orbit spares before taking over active duty. GOES – the Geostationary Operational Environmental Satellites – have been the backbone of U.S. weather forecasting for over four decades, finding their roots in 1974 as the high-altitude segment of the American weather fleet. As part of modern-day weather satellite systems, spacecraft in Geostationary Orbit are tasked with the collection of rapid-refresh data to follow cloud patterns, collect medium resolution atmospheric profiles and a number of auxiliary products while low-orbiting satellites at 800 Kilometers provide less frequent data but can collect detailed atmospheric profiles to feed into numerical forecast models. 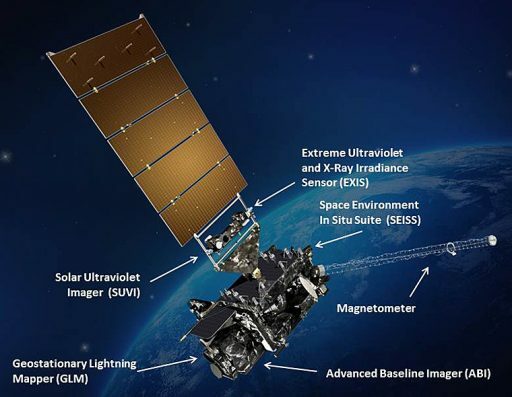 The new GOES satellite generation represents a quantum leap over the first three generations of geostationary weather satellites, scanning the Earth five times faster, offering four times the resolution and improving spectral coverage by a factor of three while also inaugurating new instruments to reduce false tornado warnings and further capabilities in the emerging field of space weather forecasting that is gaining importance given the increasing reliance on satellites in our everyday lives. 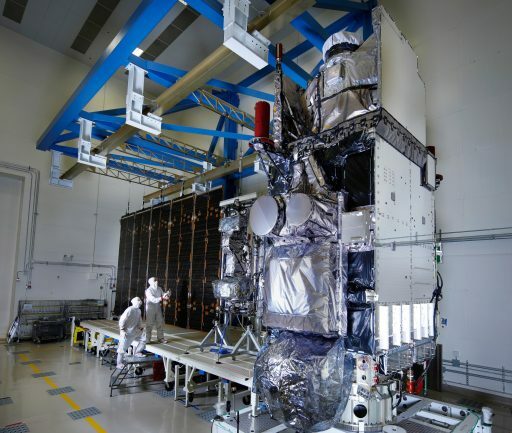 Each fourth-generation GOES satellite hosts six state-of-the-art instruments – two pointed at Earth to collect imagery, atmospheric soundings and lightning data, two scanning the sun for UV and X-ray emissions and two taking measurements of near-Earth space to provide the first warning of incoming space weather events. The core instrument of the satellites, the Advanced Baseline Imager, is responsible for 95% of the data coming from the spacecraft, doubling as an imaging and sounding instrument. Scanning the entire visible disk of Earth as frequently as every five minutes and delivering sub-frames of events of interest every thirty seconds, ABI creates the equivalent of 200 HD movies every day. Each scan collects data in sixteen spectral channels as opposed to five on the heritage system that could only take one full-disk image every 26 minutes. The increase in spectral coverage and the high spatial resolution of up to 0.5 Kilometers allows ABI to obtain detailed pictures of cloud movement, watch over storms at unprecedented measurement cadence, and identify fires on the ground to aid fire detection and response. ABI’s spectral coverage enables deeper insight into moisture levels, cloud type and height, fog and snow identification, as well as aerosol and ash cloud detection. Because the Harris Corp. ABI combines the functions of two heritage instruments, GOES had an open instrument slot to fill, opting for the addition of the Geostationary Lightning Mapper. GLM employs a novel algorithm that collects and compares 500 frames per second to pin-point all types of lightning in day and night conditions. Real time insight into lightning can significantly enhance warning reliability and lead time for tornado outbreaks and other severe weather, cutting the number of false warnings in half. The two sun-watching instruments of the satellite are tasked with delivering full-disk images of the sun in six ultraviolet bands plus spectral data in the extreme-UV and X-ray range to characterize active regions for accurate assessments of coronal mass ejections and flares that can impact Earth’s geomagnetic environment. Energetic particles and electromagnetic characteristics of near-Earth space are measured by a pair of in-situ instruments – providing the first measurement of incoming space weather and warning satellite operators of potentially harmful electrostatic discharge and radiation events. GOES-R was declared operational on December 18th in the GOES-East slot at 75 degrees west longitude; GOES-S will be destined for the GOES-West position at 137°W where it will become operational in around six months to deliver more accurate and timely forecasts for the West Coast, Alaska, Hawaii and Central America. The GOES-East position was given priority and received the first GOES-R-class satellite to watch over hurricanes, but, as recent events have shown, a similar capability at GOES-West will also save lives as West Coast states have been impacted by wildfires, dense fog and periodic rain causing deadly floods and mudslides. Sending GOES-S into orbit was up to the second-most-powerful version of ULA’s Atlas V rocket, beefed up with four AJ60 Solid Rocket Boosters installed around the Common Core Booster first stage with Centaur fulfilling the role of upper stage and a five-meter payload fairing enshrouding the six-meter tall satellite. 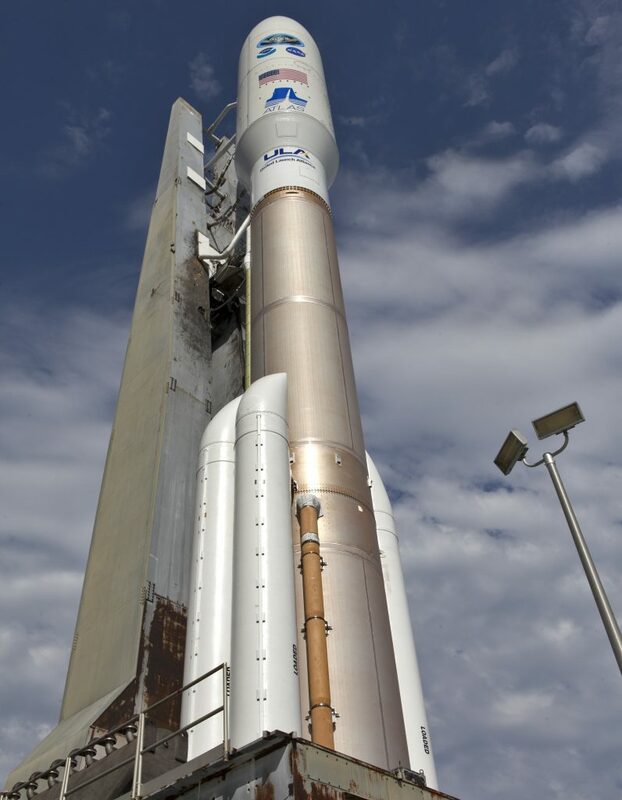 The 62-meter Atlas V rocket, designated AV-077, formally entered countdown operations at 15:12 UTC on Thursday, gearing up for a two-hour launch window. Most of the early countdown operation was dedicated to a detailed checkout campaign on the rocket while teams put the finishing touches on ground systems at the SLC-41 launch complex. 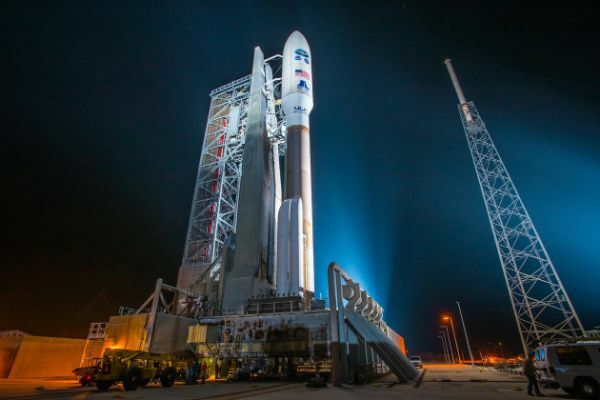 Cryogenic propellant loading started when the countdown resumed from a planned pause at T-2 hours, initiating the process of loading the two-stage stack with supercold Liquid Oxygen and Liquid Hydrogen propellant plus Helium pressurization gas. Filled with over 300 metric tons of liquid propellants plus some 165 tons of solid propellant packed into the four boosters, Atlas V entered the fast-paced events of its four-minute Automated Countdown Sequence after all support stations provided a unanimous GO for the rocket’s afternoon liftoff. The 540-metric-ton vehicle came to life three seconds before launch when firing up its Kerosene-fueled RD-180 main engine, soaring to a launch thrust of 3,827 Kilonewtons. 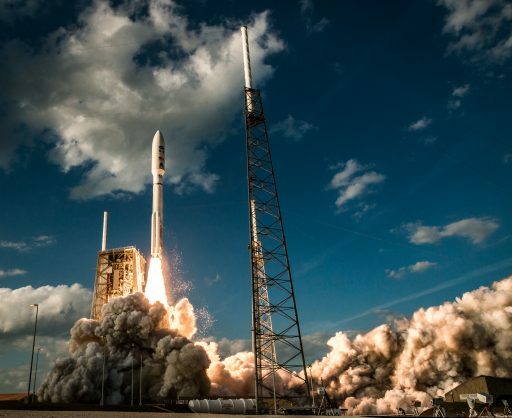 Atlas V leapt off the ground at 22:02:00 UTC when its four boosters fired up to take the vehicle skyward with a total launch thrust of 1,080 metric-ton-force – exceeding the rocket’s mass by a factor of two and making for a speedy climb-out from its Mobile Launch Platform. Five seconds into the flight, Atlas V had cleared the lightning towers surrounding its launch pad and began its pitch and roll programs to attain a launch azimuth to the east-south-east, departing Florida on the standard route toward Geostationary Transfer Orbit. 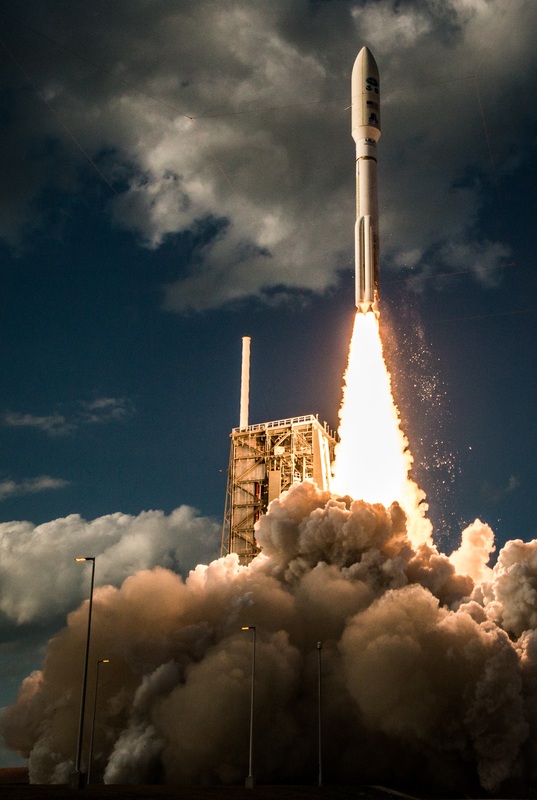 With the help of its boosters, Atlas V pushed through the sound barrier after just 36 seconds and the RD-180 throttled back briefly as the vehicle passed Maximum Dynamic Pressure at the 47-second mark into the mission. Thrust on the four boosters tailed off at T+94 seconds after each burned 41 metric tons of propellant to deliver the initial kick needed by Atlas V to deliver its heavy load into an optimized Geostationary Transfer Orbit. The 17-meter long SRBs dropped away in pairs at T+1 minute and 50 seconds and Atlas V switched into Closed Loop Control a short time later after flying a pre-programmed attitude profile when ascending through the dense atmosphere. The Swiss-made Payload Fairing split open and separated three minutes and 30 seconds into the flight followed moments later by the jettisoning of the Forward Load Reactor as Atlas V shed no-longer-needed weight on its climb into orbit. 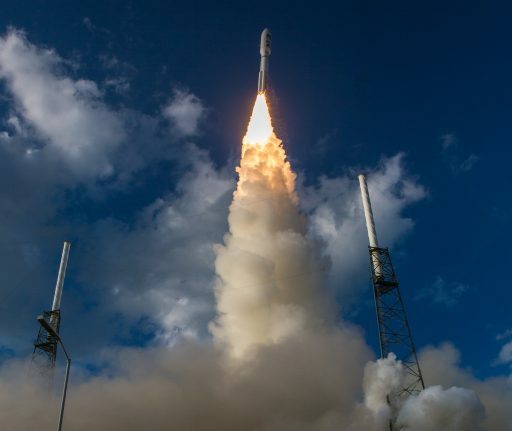 RD-180 entered its throttle segment a short time later, limiting acceleration toward the end of the first stage burn as the vehicle only weighed a tenth of what it did at liftoff by that point of the flight. BECO – Booster Engine Cutoff was called out four minutes and 22 seconds into the flight after the RD-180 burned through 284 metric tons of Rocket Propellant 1 and Liquid Oxygen. The 32.5-meter long booster pulled away from the Centaur upper stage six seconds after cutoff using eight retrorockets and Centaur immediately headed into pre-start of the Aerojet Rocketdyne RL-10C engine. Centaur soared to a thrust of 10,400-Kilogram-force at T+4 minutes and 38 seconds, beginning a planned seven-minute and 34-second burn tasked with injecting the stack into a preliminary Parking Orbit. The upper stage continued heading south east throughout its burn and switched communications to NASA’s TDRSS system as it traveled across the Atlantic Ocean, achieving an orbit of 180 by 540 Kilometers, inclined 28.15 degrees. 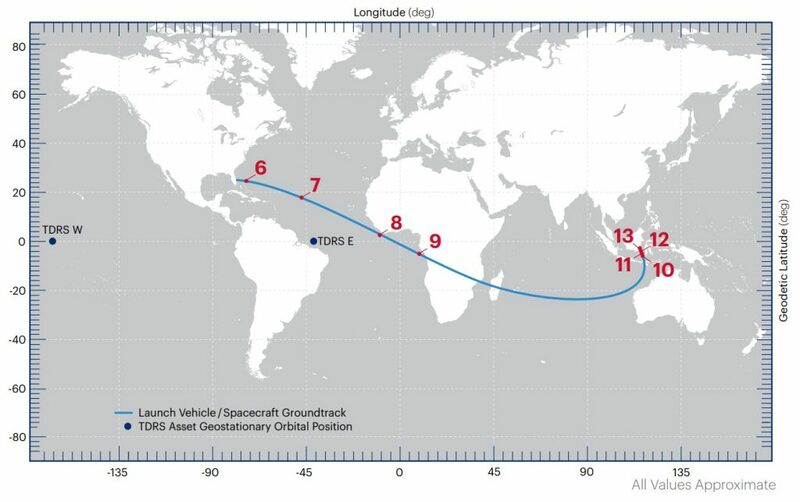 Instead of a standard two-burn delivery into GTO, Thursday’s mission employed a more complex three-burn mission intended to deliver GOES-S closer to its operational orbit. A standard GTO-injection would require the satellite to deliver a total change in velocity of around 1,800 meters per second to reach Geostationary Orbit whereas Thursday’s mission was aiming for a GTO-1,140m/s orbit, cutting over 600m/s from the transfer which translates to more than four years of additional stationkeeping propellant reserves. 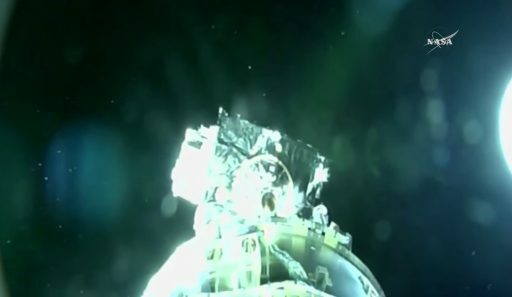 Centaur fired up its RL-10 engine again at T+22:38 on a burn of five minutes and 31 seconds while crossing the equator over the Gulf of Guinea to significantly boost the apogee of the orbit and position it close to the equator on the opposite side of Earth. The onboard navigation system showed Centaur reached an orbit of 204 x 32,780 Kilometers, 25.69° and the upper stage settled in for a passive flight phase of exactly three hours, crossing Sub-Saharan Africa, heading out over Madagascar and the Indian Ocean before starting the critical third burn while approaching the prospect apogee location of the finalized injection orbit. RL-10C was re-started three hours and 28 minutes into the mission and fired for 94 seconds to significantly raise the orbit’s perigee, top-up the apogee to match Geostationary altitude and conduct a major plane change to reduce the orbital inclination – aiming for an insertion orbit of 8,215 by 35,287 Kilometers at an inclination of 9.52 degrees. Launch Control called out a clean shutdown and Centaur’s navigation platform showed an orbit of 8,201 by 35,290 Kilometers, 9.53° – marking another spot-on insertion for the workhorse and allowing GOES-S to operate one year longer than GOES-R through a further inclination reduction of one degree compared to the 2016 mission. 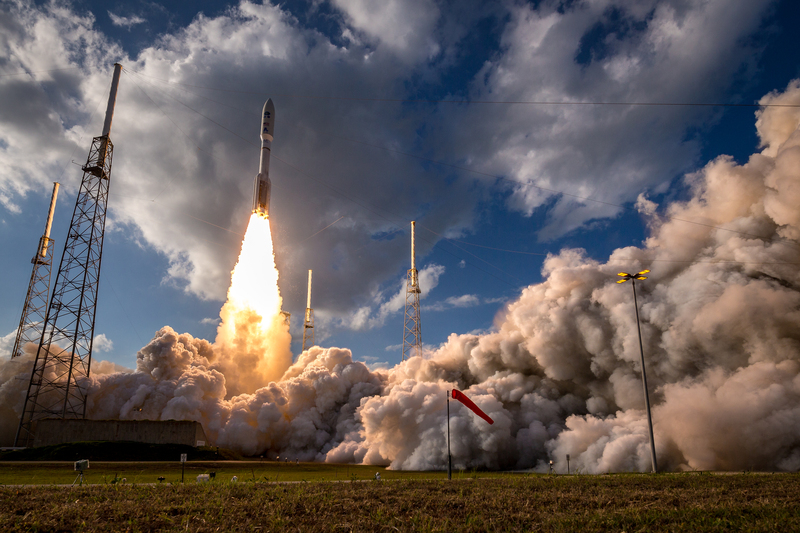 GOES-S was deployed at the three-hour and 32-minute mark into the mission and applause emerged at Launch Control after another flawless mission by the Atlas V. Drifting away from the Centaur upper stage, GOES-S made the first steps in a mission of at least 15 and up to 20 years. First stage deployment of the craft’s solar array was planned 16 minutes after separation followed by initial acquisition of two-way telemetry and command links to enable Lockheed Martin teams to complete a cursory health inspection. GOES-S is expected to make its way up into Geostationary Orbit over the next three weeks ahead of six months of in-depth checkouts and instrument characterization.